Designed to support feline urinary tract health and help maintain normal pH which may reduce the likelihood of crystal formation. 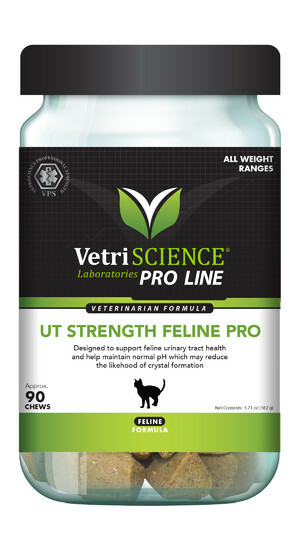 UT Strength Feline Pro is formulated to support feline urinary tract health by addressing both the physical and emotional pieces of the puzzle. D-mannose, a naturally occurring simple sugar, attracts and attaches to unhealthy bacteria before the body eliminates it. N-acetyl glucosamine (NAG) supports structural integrity and functionality of the UT tract. Bromelain, corn silk, cranberry powder and probiotics support a normal inflammatory response and a healthy UT environment. Colostrum Calming Complex® is shown to have a positive effect on emotional states in stressful situations. Cats may be less prone to UT challenges by maintaining a healthy emotional state. Available exclusively through veterinarians. 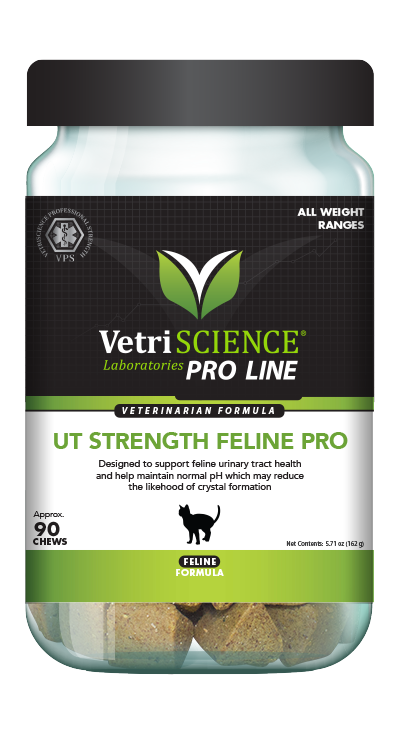 Ask your vet about UT Strength Feline PRO today! Directions for Use: Give 1 chew, 2 times daily. silicon dioxide, sodium alginate, soy lecithin, vegetable oil.